August seems to be my busiest month for birthday cards and then there's a flurry of birthdays in November. So I'm trying to balance my Christmas card production with covering my birthday card requirements. This, more masculine card, will be for one of our great team at the office. It's my first play with the Just Add Color Designer Series Paper that is perfect for use with the Stampin' Blends alcohol markers. It was so much fun - I can't wait to colour in the other great designs! 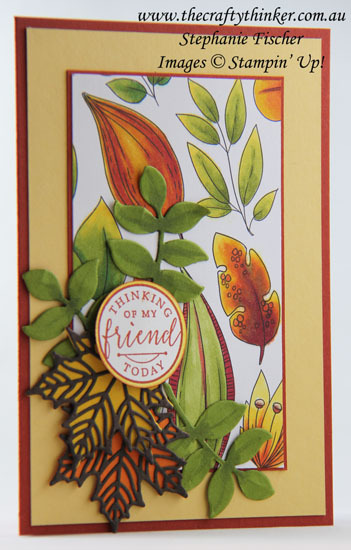 I used layers of Cajun Craze and So Saffron for the card and finished it with foliage cut with the Seasonal Layers and Eclectic Layers die sets using Crushed Curry, Pumpkin Pie, Early Espresso and Old Olive card scraps. I used the Old Olive Blends on the Old Olive foliage to add some dimension and tie it in with the alcohol marker background. The greeting from Hello Friend is stamped with Cajun Craze ink, punch out with the 1.25" circle punch and edged with a So Saffron Blend.